Paul and Brian Faessler are taking names and setting records in their purpose-built GT350 Mustang. With almost 4 digits of power on tap, and matching skill in the driverseat, the team is scorching the time attack circuit. At its core, building a race car is about one thing: problem solving. Just as the fastest route around a racetrack exists in the perfect line, the best competition machine is definite mechanical formula. Building it is simply a matter of finding it. Thirty-three years ago, Paul Faessler was a young Ford guy working his first graduate job as a mechanical engineer for GM. He was good at what he did, but when it became clear that his path for advancement would require him to leave engineering for management, in the form of promotions he continually turned down, he quit the corporate life and established Paul’s Automotive Engineering as a Mustang restoration shop based in his garage. Three years later he’d move into an 18,000sq-ft facility on the outskirts of Cincinnati, OH, where his business grew to include a dozen employees and yield many 100-point concourse Shelby and Mustang restorations, winning over 200 MCA and SAAC National Gold honors. Ford Performance Boss 302 5.0L engine, custom Paul's Automotive Engineering front subframe plate, Wiseco pistons, BoostLine connecting rods, Ferrea valvetrain, springs, Dailey dry-sump oiling system, Cobra Jet intake, PAE/Tial turbo system and manifolds, C&R radiator, Tru Cool trans cooler, diff cooler, Spal fans, Motec M150 ECU, Injector Dynamics ID1000 fuel injectors. After 20 years of perfecting that craft, Paul was looking for a new challenge once again. His focus shifted to performance and he began building Mustangs the race circuit rather than the concourse lawn. Many cars left PAE as bona fide drag racers over the years, including what was once the fastest NMRA Super Street class car in the country, running 7.71 seconds at 193 mph in the quarter-mile. But Paul’s real passion became building Mustangs for the road course, namely NASA’s American Iron and American Iron Extreme racing series, and time trial competition. In those ranks, PAE builds have won over a dozen national championships. Soon, Paul himself caught the racing bug, building and campaigning a ‘65 Mustang NASA sprint race car in 2004. By 2008 he earned his first AIX National Championship title with his son, Brian, serving as crew chief. Paul and Brian began doubling up in and winning time-trial competition from behind the wheel of an unlimited-class 2014 Mustang. Paul's focus shifted to building cars and supporting his son's racing. Brian soon earned his own championships in AI, AIX, and STR-class competition, and Driver of the Year–honors in NASA’s Great Lakes region. A GearTronics paddle shift setup makes for quick shifting in the Quaife QBE69G 6-speed sequential transmission. When Ford and Ford Racing, which became close partners with PAE over the years, offered to support the build of an all-new competition machine based on the sixth-generation Mustang, Paul and Brian wasted no time seizing the opportunity. A body-in-white wasn’t yet available, so a brand-new 2015 Ford Mustang (V6) was purchased at a local dealership, flogged at a local track in stock form–just for fun– and then completely gutted all within one week. Road cars today are built with generous amounts of heavy reinforcements to their sheet metal to comply with modern crash safety standards, sound-deadening material to improve NVH scores, and are loaded pretty heavily with creature comforts. Every unneeded tab, bracket, redundant layer of sheet metal, hydroformed tubing, solenoid, speaker, padded trim, and inch of unneeded wiring was jettisoned from the car to save weight. Paul, Brian and two, long-time PAE technicians got to work rebuilding the car into something that would at once be the perfect mechanical recipe for winning. While Paul Faessler's engineering prowess is largely to credit for the car's mechanical capability; son, Brian, now spends the majority of the time behind the wheel clicking off wins and records. A complex roll cage made from Docol R-8 steel (which boasts a higher tensile strength and better consistency than 4130 chrome-moly) was fabricated to integrate with the Ford unibody and provide added safety to the driver, as well as reinforce suspension points, support interior amenities, and more. Paul scrapped the car’s factory McPherson suspension in favor of a lighter, more modular SLA kit (Short upper, Long lower Arm) he and Brian developed for PAE’s more radical performance builds, which includes a custom front k-member and rear independent suspension cradle, hubs, spindles, and control arms. A set of JRI coilovers and Speedway Engineering sway bars are used on all four corners. 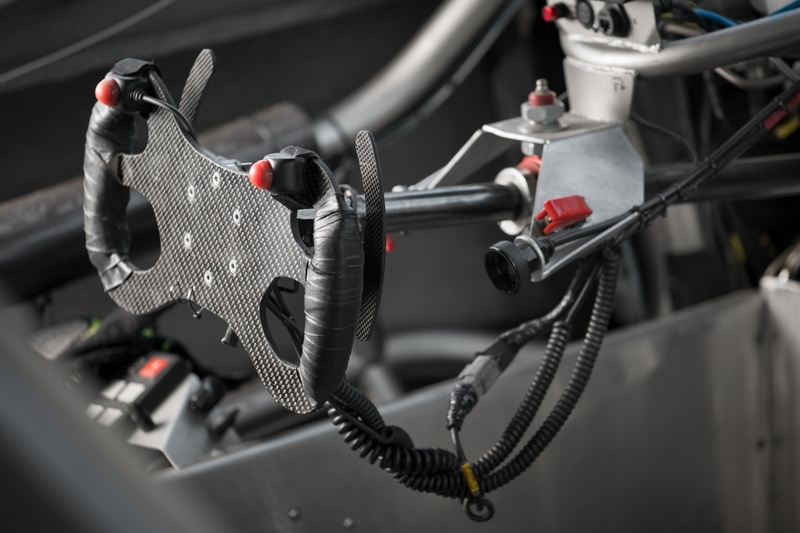 A mixed recipe of custom Brembo/PAE GT3, GT4 Pro Endurance brake components, and Hawk DTC 80 pads were developed to provide stopping duties, with the front brakes cooled via giant brake ducts residing where the factory front strut towers once did. Trackspec hood vents, help vent engine heat. If you’re thinking this V6 chassis looks a lot like a Shelby GT350, you’d be onto something. Paul wanted to retain the sixth-gen Mustang’s factory body lines (with the addition of functional aero), and decided to upgrade to — and in many cases modify — more aggressive GT350 body panels all around. Fab work to the car’s wheel wells cleared out enough room to lower it on massive 18” x 12” and 18” x 13” Forgeline wheels shod in sticky Hoosier slicks or DOT rubber without the need for aftermarket fender flares. A factory-fresh Boss 302 5.0L V-8 “Coyote” crate engine was sourced to replace the 3.7L V6 through Ford Racing, and was torn down and rebuilt at PAE with custom Wiseco pistons, BoostLine connecting rods, and a full Ferrea valvetrain treatment to the cylinder heads. Custom-fabricated PAE turbo manifolds, air-to-air intercooler plumbing and a single Tial Sport 80mm turbocharger reside between those heads and massive twin 65mm throttle bodies. With a custom Dailey dry-sump oiling system and Motec engine management, all this is good for right around 850 whp at a modest 12 lbs of boost on 104-octane unleaded gasoline, through a paddle-shifted Quaife QBE69G 6-speed sequential transmission. It’s a recipe that satisfies time-trial competition’s need for big power along with the reliability demanded by wheel-to-wheel racing, and Paul, Brian, and PAE have been running it on two engines in rotation for years, since their previous ‘14 Mustang. Each engine remains in use in the car for about a season and a half before being replaced and and refreshed as a precautionary measure. Custom Wiseco pistons and BoostLine rods help the engine perform on track. The 850hp and 700lb of torque are only a fraction of what the setup is capable of delivering. With the No. 18 2015 PAE Ford Mustang completed –along with a turbo ‘65 Mustang built for Paul to clean up in NASA’s AIX, TTU and SCCA’s SPO competition– and the business of PAE focusing more comfortably on a smaller, more select crop of late-model performance builds, Paul and Brian got to work on the races once again. 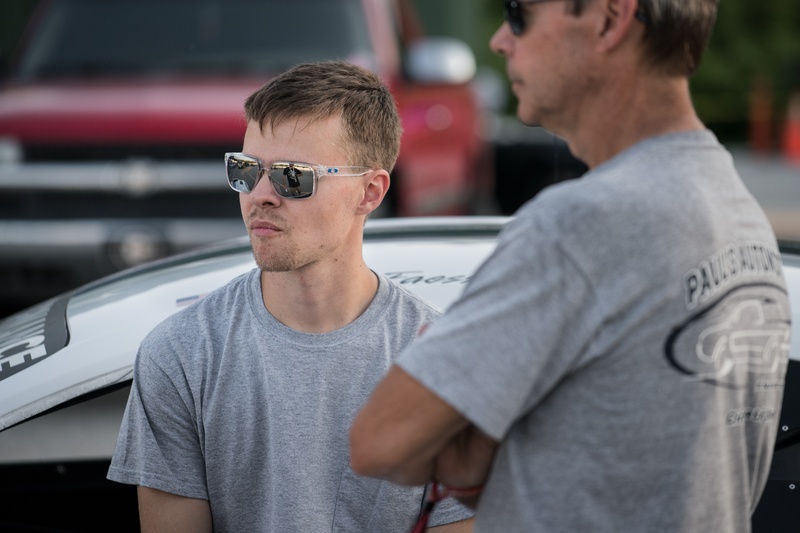 With Brian behind the wheel, the ‘15 Mustang won nine straight races in NASA Super Unlimited and Time-Trial Unlimited competition, and the TTU National Championship in 2016, resetting the Watkins Glen class/track record by a full seven seconds in the process. The team also entered the car in North American Road Racing Association (NARRA) competition — a series dominated by Dodge Vipers — and won the TTU-class National Championship for the second consecutive season. By the end the 2016 season Paul, Brian and their two Mustangs had started 26 races, won 22 of them, earned three 2nd Place finishes, and broke six track records. And they were looking for more challenges to add to the roster. 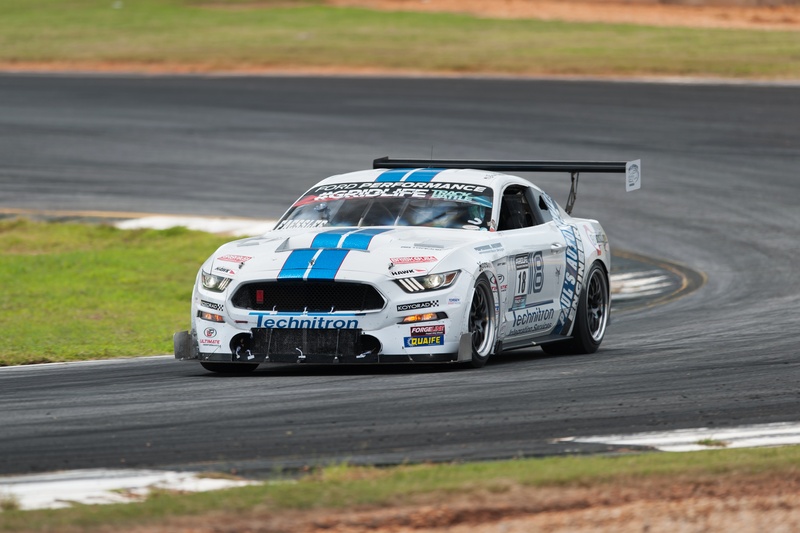 A 2016 testing day at Road Atlanta coincided with Global Time Attack competition, and the team learned their car could be campaigned in the Pro/Comp class. It was the only car in the class at that event, but the 1:23.896 best time Brian clocked was fourth-fastest overall behind two monster Nissan GT-Rs and the GST Motorsports’ famed Impreza. The Mustang’s mere presence high atop a leaderboard conventionally led by stripped, gutted, and purpose-built imports garnered a lot of valuable press, and was enough to get Paul and Brian thinking more critically about one of racing’s fastest upstart disciplines. PAE Docal R8 roll cage, custom racing seat, Sabelt 6 point harness, Stilo helmet, Sparco drivers suit, Coolshirt System, Motec C125 driver display, PDM30, Keypad 15, Tilton pedals, reservoirs; AJ Hartman carbon-fiber steering wheel, shift paddles, Sweet Performance steering column, hub, Guerrilla Air carbon-fiber air tank, Motorola radio system. This year, Brian improved his time and standings at the same event, clocking a 1:23.712 in Pro/Comp and moving up to 2nd overall. He and the Mustang then ran even faster at the Gridlife South / TrackBattle round four event at Road Atlanta, taking the Unlimited RWD class win with a 1:23.418 and landing just about a half-second behind perennial, overall winner Jeff Westphal and that Unlimited AWD-class GST Impreza. Most recently the team took to the tarmac of M1 Concourse in Pontiac, MI, for the Speed Ring festival, where Brian and the ‘15 Mustang took 1st in Unlimited RWD competition, with Paul and his ‘65 claiming 2nd. Data continues to show room for improvement as Paul and Brian chase down that perfect tune and perfect line for the remainder of 2017. As potent a competitor as the car has proven to be in both wheel-to-wheel racing and time-trial/time-attack competition, there are ways it could be modified to better suit each discipline. 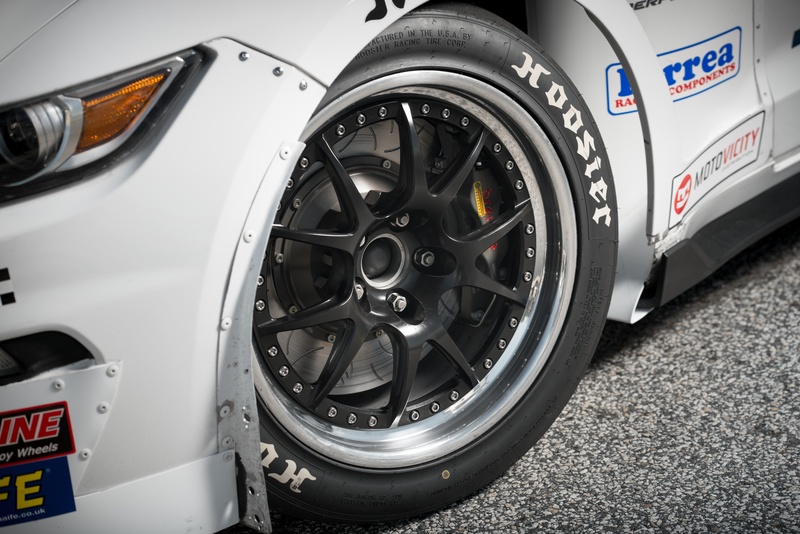 Forgeline wheels and massive Hoosier slicks provide the grip, while Brembo brakes with Hawk pads provide the stopping power. Already in the works are plans to apply the Wiseco/Boostline treatment to a 5.2L Shelby GT350 V-8 engine and shoot for an even wider powerband with closer to 1,000 hp. But will the team use it to chase down perfection in any one area? Will they continue to push the limits of their dualistic build as far as possible? In either case, if their goal was to build the ideal do-it-all Mustang and enjoy life, we’d say they found that formula.